GoVenture consists of the resources described below. 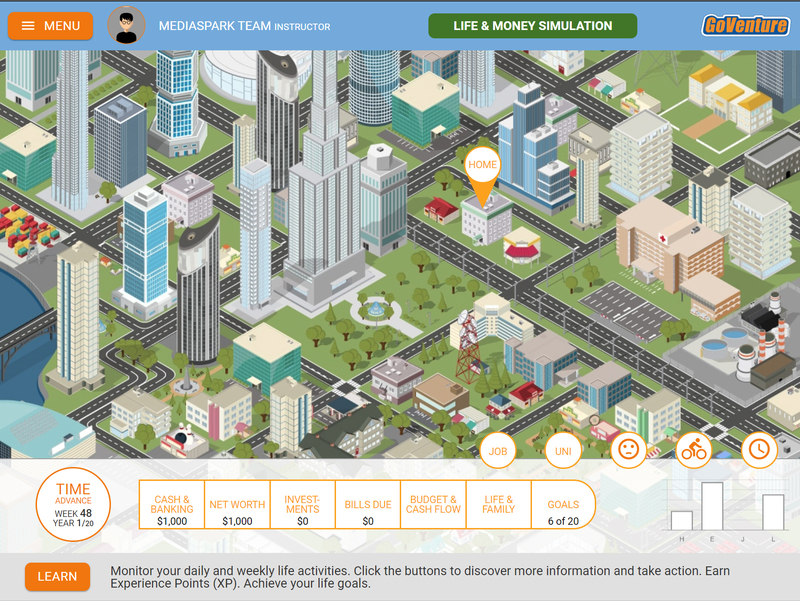 A highly interactive Simulation game that enables students to directly experience personal financial literacy and investing. Instructors can assign students to play short activities or the full Simulation. Instructors can also choose to have students play an investment-only Simulation. An accessible version of the Simulation is available as the "Your Story" simulation. Can be played for a few hours or dozens of hours. Multiple simulations with different objectives can be played at the same time. 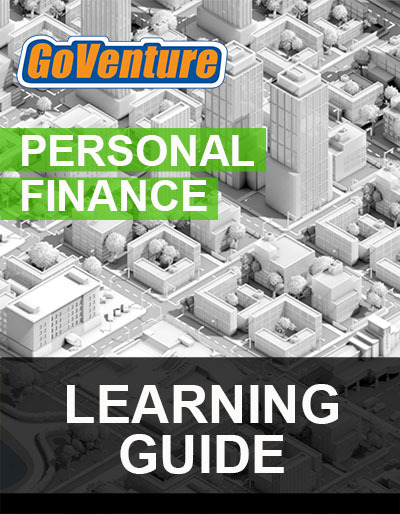 A comprehensive online guide with text, examples, and figures that explain all the fundamental topics of personal financial literacy and investing. The Learning Guide can be viewed at any time by students and instructors. Direct links to specific topics are also included at the bottom of every screen in the Simulation, making it easy for students to find support information while they play the Simulation. Contains over 70,000 words (equivalent to a 300-page book) and provides comprehensive coverage to support a full curriculum. 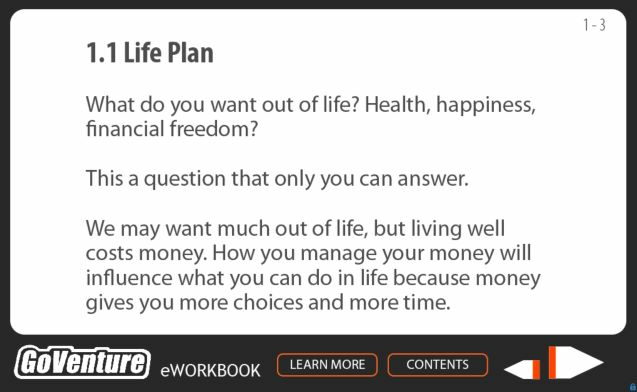 An online workbook that introduces students to the basics of life and money. Content is presented in an easy-to-read summary format, supported with brief practice exercises at the end of each section (which must be completed correctly to continue). An accessible version of the eWorkbook (but without interactive activities) is available as an Adobe PDF file - Download the Accessible eWorkbook (you must be logged in as an instructor to access this PDF file). Requires 2 to 5 hours to complete, and is the ideal learning resource for students to start with. Activities that allow students to learn and practice important financial concepts. These activities must be turned ON by the instructor. Once ON, students can play the Activities by logging in to GoVenture. Instructors can view student input using the Instructor Website. See the bottom of this Instructor Guide for details. 10 Activities. Each Activity requires 15 to 60 minutes to complete. Printable Adobe PDF exercises that support the content in the Learning Guide. PDF Activities are available at the bottom of each section in the Learning Guide. See the bottom of this Instructor Guide for details. Over 70 Activities. Each Activity requires 15 to 60 minutes to complete. 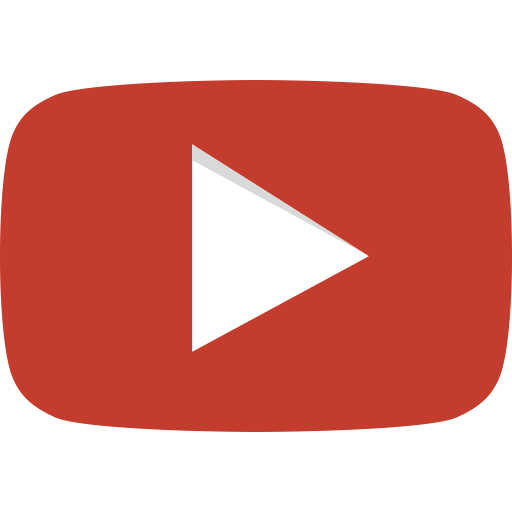 Most videos are a few minutes in duration. Video Tutorials for playing the simulation. The Simulation also includes an in-game tutorial. Helps instructors with course planning. The duration and sequence of GoVenture resources are presented with options for matching 5, 10, 20, 40+, and 110+ hours of curriculum time. A website that enables instructors to manage GoVenture and their students. Students and instructors log in to the same GoVenture website. Instructor accounts are encoded with additional privileges to provide access to a special dashboard. Once you have a Subscription Key, go to GoVenture.me and follow the links to CREATE ACCOUNT. Then log in using your username and password. Review the instructor dashboard and click the (?) button to review all the included resources. 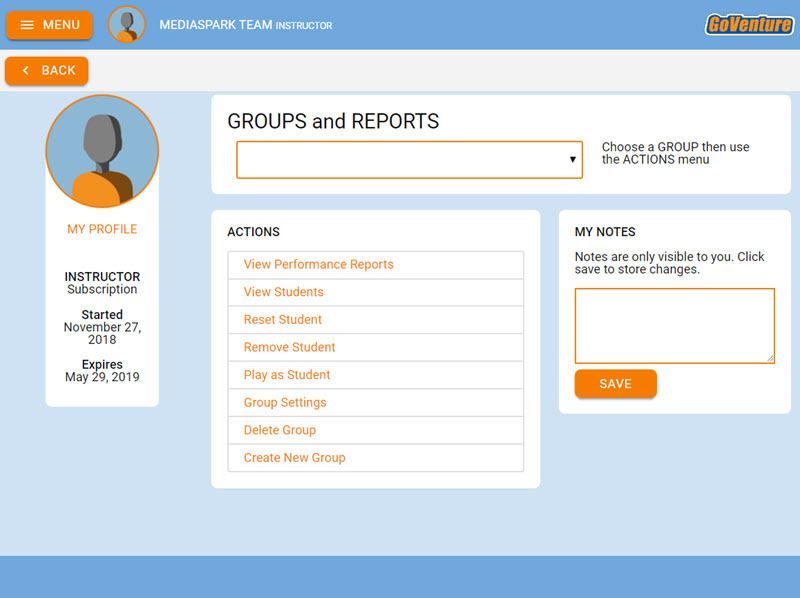 The instructor dashboard / website allows you to create Groups (see below), monitor student progress and performance, and play GoVenture as a student (so that you can experience GoVenture as a student does). For students to begin playing the Simulation, the instructor must create a new Group number. Groups allow you to keep student performance results separated by class, school, region, or any other grouping that you prefer. 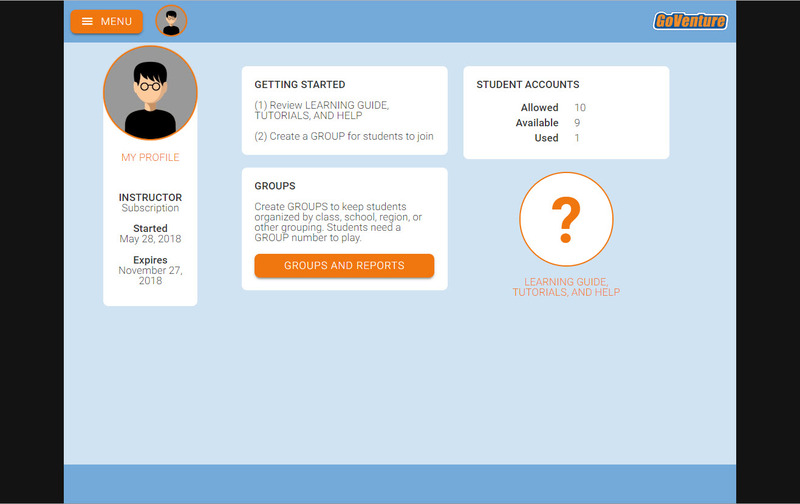 Use the Instructor Website to create a Group. 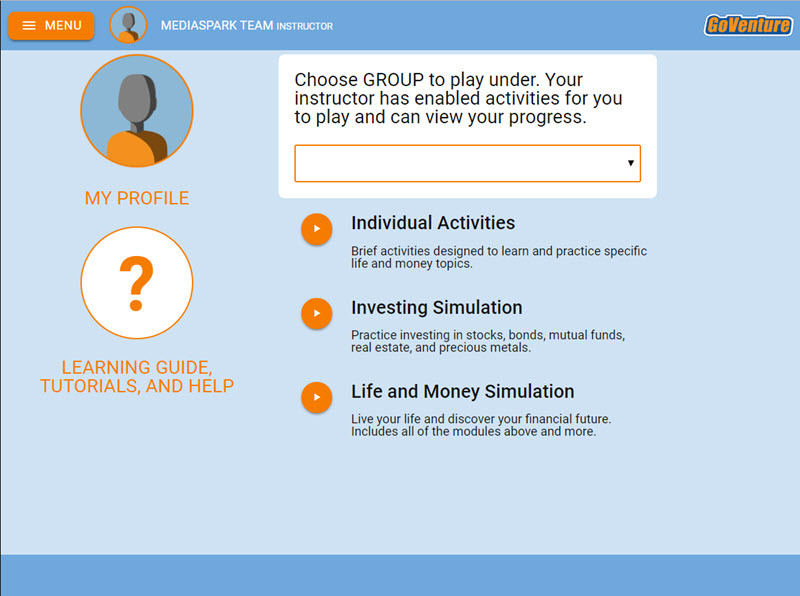 Instructors have the option to focus students on specific individual activities, an investment-only Simulation, or the full life and money Simulation. Options that are not turned ON will be visible but disabled to students who join the Group. Keeping options OFF helps avoid the possibility of students playing the wrong activity, or playing an activity sooner than planned by the instructor. Follow the on-screen directions to choose your Group settings. And then copy the Group number (7-digit number). You will share the Group number with your students so that they can connect with you. Instructors can also use the Group Number to play as a student. Students cannot play GoVenture until an instructor provides them with a Group number. You must give students a Group number. Students can log in to view the Learning Guide, eWorkbook, and Videos before they receive a Group number. This allows you to get students set up with their login accounts in advance of having them do a specific activity. Instructors can play GoVenture as a student by clicking the PLAY AS A STUDENT. It is highly recommended that instructors play GoVenture for a few minutes to experience the options available in the program. 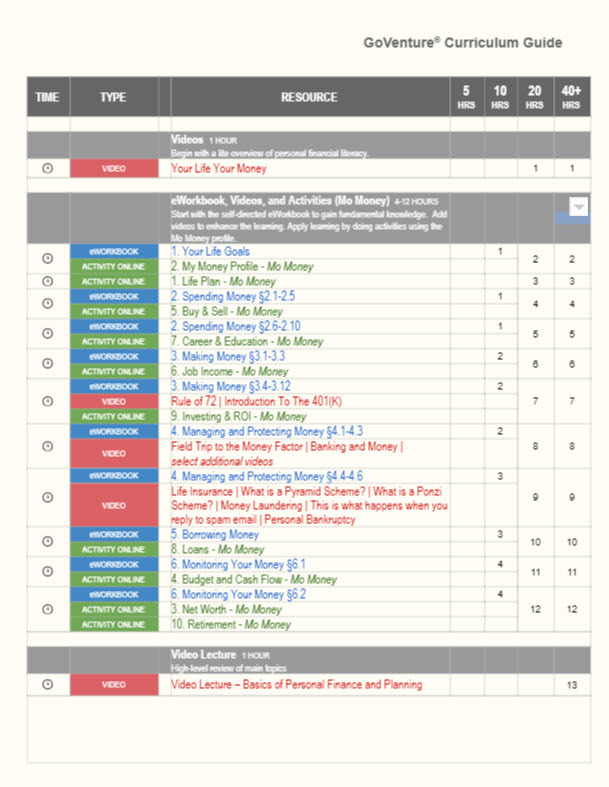 Screenshot of the Student Dashboard/Website with the three modules turned on (Activities, Investing Simulation, and Life and Money Simulation). If a module is turned OFF, the orange button turns grey and is disabled. GoVenture has two types of subscription systems: Learner Managed and Instructor Managed. 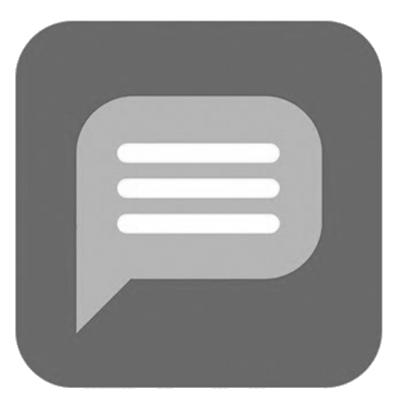 Instructor Managed subscriptions are assigned to K-12 schools, where student anonymity is important and student accounts need to be managed by an instructor. The Learner Managed system used by colleges, universities, nonprofits, and businesses does not use this method of account creation and login – instead, it uses a conventional method where students create and manage their own accounts. Instructor Managed subscriptions do not require students to create full accounts on GoVenture. Students do not have to disclose any personally identifiable information. A student only needs to use a name, pseudonym, or student ID and password to play GoVenture. An instructor using GoVenture should consider how much curriculum time is available and which learning outcomes need to be achieved. 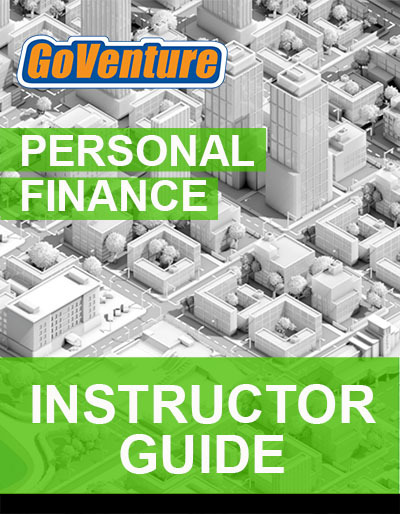 GoVenture covers all or nearly all educational standards for personal financial literacy. Satisfying hundreds of standards can take dozens of hours of time. Instructors that will use GoVenture as the primary resource for a full curriculum will likely use all the available resources, particularly the comprehensive Learning Guide and related PDF Activities. Instructors that only have a few hours of curriculum time for GoVenture, may focus primarily on the eWorkbook, Online Activities, and the Simulation. All resources can be used independently of each other. When students first play the Simulation, an in-game tutorial will appear that will walk them through the main components of the Simulation. Students can click the LEARN button, found at the bottom of the Simulation interface, to link directly to section 23 of the Learning Guide for additional guidance. Note that there is no printable User Guide. Start with the eWorkbook as it covers key concepts in summary format. The Learning Guide provides comprehensive coverage to support a full curriculum. Activities can be used for practice and grading. If Internet problems arise and saving cannot be done automatically, students will be alerted with a warning message and an option to try saving again. A student can only play any number of Simulations at he same time by using different GROUP numbers. To allow a student to restart the same Simulation, use the RESET STUDENT option. Resetting a student will delete all progress and performance data for that student, allowing the student to start over. Note that Simulations will always have different results. Use the REMOVE STUDENT option to completely remove a student from a GROUP and delete all progress and data for that student. Removing a student is normally only done if a student has joined the wrong GROUP. Note that student accounts cannot be reassigned from one student to another. Students can take as much time as they want to make decisions in GoVenture. There is no clock or time limit, except that an investment or full life and money Simulation will end after 20 simulated years. How quickly a student will progress through the Simulation will depend on how thoughtful their decisions are and the instructor’s requirement for progress. For example, the instructor may tell students that they must progress through 1 simulated year within the next 60 minutes, thereby providing students an average of 1 minute to make their decisions each simulated week. Students should be provided at least 2 minutes of decision time for each virtual week, plus any additional time needed to periodically evaluate reports in more depth. The eWorkbook requires students to read a section and then successfully complete a brief practice exercise. Each exercise can be repeated until successful. Attempts are not recorded or graded. Students that have fully completed the eWorkbook have demonstrated some level of competency in the subject matter. Instructors can monitor student progress via the Instructor Website. The Learning Guide can be used to learn about subject matter and as a reference, but has no grading system. 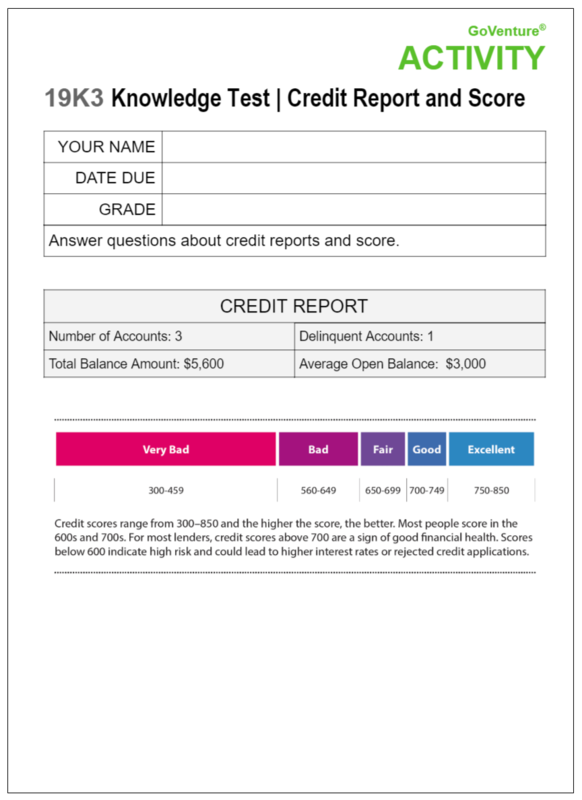 The PDF Activities can be used to assess and grade students on the subject matter. GoVenture allows you to hold competitions by comparing student performance results. Awarding prizes to the winners is always a great motivator. Prizes should be announced at the beginning of the competition, and could be simple inexpensive gifts or even extra marks. There are over 70 PDF Activities - printable Adobe PDF exercises that support the content in the Learning Guide. PDF Activities are available at the bottom of each section of the Learning Guide. Completed Activities with answers for instructors are available upon request - contact us. A full list of available activities is included in the table below. There are 10 ONLINE Activities that allow students to learn and practice important financial concepts. These activities must be turned ON by the instructor (through GROUP settings). Once ON, students can play the Activities by logging in to GoVenture. Instructors can view student input using the Instructor Website. 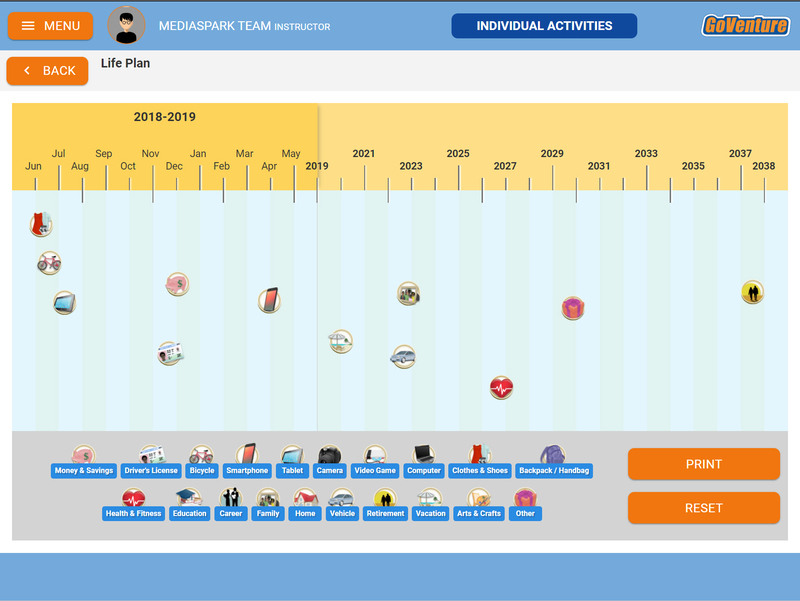 Information on how to play each Activity is available to students by clicking the LEARN button in each Activity - the LEARN button links to this document. Instructors can encourage students to research the information they need to make the data more personally relevant. Instructors can use custom profiles to guide students to discover key information that matches the curriculum. The tables below provide a summary list of each Activity. Each activity is numbered for easy reference. See Performance Evaluation and Grading for language skill development and grading rubrics. You must be logged in as an instructor to download the above file. Build your short-term and long-term life plan by adding goals to a visual calendar. Consider the type of lifestyle you want to have and how comfortable you are with taking financial risks to achieve your goals. Build a Net Worth statement - an indicator of your personal wealth. Add up all the money you receive each month and subtract all the money you pay out. Discover the cost of common products and how they may lose monetary value over time. Determine how much money you can earn with a job, minus employment deductions and taxes. Determine the financial benefits and costs of education for a specific job. Calculate the Return On Investment (ROI) of various investment options. Determine how much money you may need when you retire. Individual GoVenture resources may be accessible to students with disabilities, depending on the type and degree of disability. All GoVenture resources are accessible to students who are deaf or have a hearing or speech impairment. All but one GoVenture resource is accessible to students with a physical impairment, because GoVenture resources can be used with either a mouse or keyboard. Only some GoVenture resources are accessible with a screen reader. Students who are blind or visually impaired to the degree that they require a screen reader will not be able to use all GoVenture resources — alternatives are provided. Students who are visually impaired but do not require a screen reader will be able to use all GoVenture resources. A GoVenture Accessibility Guide is available that identifies the requirements of each GoVenture resource (see link below). When students log in to GoVenture, they are given the option of navigating to the REGULAR version or the ACCESSIBLE version for people with disabilities. If they choose the ACCESSIBLE version, they will be directed to a basic webpage that only lists the GoVenture resources that are fully 100% accessible for all types and degree of disability (hearing, vision, and physical). Note that instructor logins will always navigate to the REGULAR version even if the ACCESSIBLE version is chosen from the dropdown. Depending on the degree of disability, a student may capable of playing additional GoVenture resources that are not listed on the ACCESSIBLE webpage. Playing additional GoVenture resources may provide the student with a richer and more comprehensive learning experience. To access the full list of GoVenture resources, a student can log in to GoVenture by choosing to view the REGULAR version instead of the ACCESSIBLE version — instructor assistance may be required. Instructors are encouraged to work with students with disabilities to identify which additional GoVenture resources may work for best them.